Precision Agriculture has the potential to improve Australian agriculture by making it more resilient, productive and profitable while reducing environmental impact and increasing social value. Improvements in farm profitability and Australia's global competitiveness can be achieved through integration of digital data generated by sensor technologies with existing landscape and legacy data sets from many sources. The use of open standards in this process of discovery, assessment, access and use of data, sensors and processing services will allow collaboration, fluid publishing and dynamic decision-making. This project will advance current areas of managing livestock health and management information systems by developing software and systems to enhance the ability of individuals, business, government, and industry to better use information systems in their daily business decision making and workflows. The project is directly aligned with CeRDI's involvement in the development and implementation of international data exchange standards through the Open Geospatial Consortium. Novel research will be undertaken in collaboration with national and international initiatives. The ultimate aim is to federate and exchange livestock health and management data from multiple organisations, as well as disparate sensor technologies and proprietary systems, using existing or developing standards with appropriate web-based technologies such as GML, RDF or Linked Data. The use case scenarios will be developed in collaboration with the Regional Universities Network Precision Agricultural Flagship collaborating partners using actual data from agricultural research projects such as the Smart Farm sensor networks at the University of New England and Central Queensland University. Bahlo, C. (2016, July). 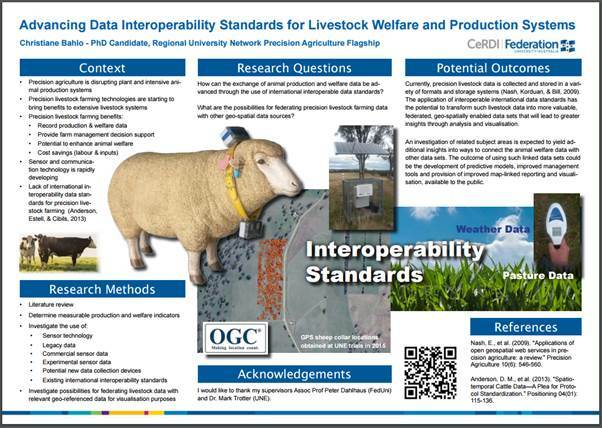 Advancing data interoperability standards for livestock welfare and production systems. Poster session presented at the Federation University Australia HDR Research Conference, Mount Helen, Australia.